November 19, 2014 07:00 ET | Source: Impinj, Inc.
SEATTLE, WA--(Marketwired - Nov 19, 2014) - Leading Item Intelligence platform provider Impinj, Inc. has launched the much anticipated xArray gateway into full production, ushering in an exciting new era of fixed-infrastructure RFID reader technology. Fueled by strong market demand from more than 30 certified partners and a wide range of end users around the globe, the xArray gateway is a game-changing integrated reader system featuring always-on wide-area monitoring of the identification and location of RAIN RFID tagged items. Designed for large-scale item-level applications in retail, healthcare and manufacturing, the xArray gateway provides real-time Item Intelligence events including each item's identity, location, and authenticity. When combined with the Impinj Platform, the xArray gateway gives businesses unprecedented inventory visibility, allowing them to improve their operational efficiency and provide better service to their customers. Today, many businesses are unable to make sound decisions based on inventory data because the updates to those data are infrequent and often unreliable. This lack of real-time inventory visibility degrades operational efficiency and, ultimately, customer satisfaction. The xArray gateway provides continuously updated inventory information and real-time location of individual items; all without human intervention. This increases employee productivity and satisfaction by removing tedious inventory collection activities. 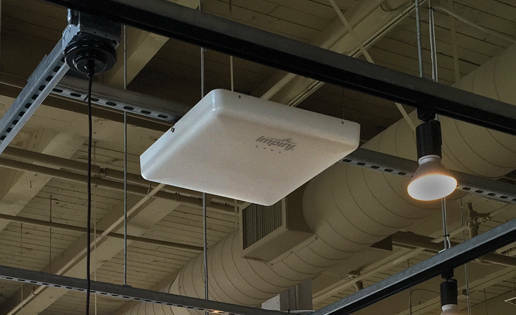 Designed for easy installation and use in nearly any building or facility, the xArray gateway finally provides businesses with accurate inventory data. The xArray gateway is a ceiling mounted reader system designed to free up valuable floor space. It is easy to install and uses a single Power-over-Ethernet connection. A single xArray gateway can visualize up to 1500 square feet (139 square meters)* of floor space; multiple xArrays can cover a zone of any size and shape. "The xArray gateway will forever alter inventory visibility by replacing infrequent, manual inventory taking using handheld RFID readers or barcode scanners with always-on, real-time automated inventory," said Chris Diorio, Impinj's CEO. "The advent of fixed-infrastructure inventory solutions based on xArray gateways will relieve employees from the drudgery of inventory taking, dramatically improve inventory visibility, and provide heretofore unavailable information such as the real-time location of each individual item within a facility." "We believe that the combination of the Impinj xArray gateway and our Crosstalk software will revolutionize UHF RFID use-cases and will bring item intelligence to the next level -- both in gate as well as in RTLS scenarios," said Patrick Hartmann, Global Sales Director at noFilis. "CreativeSystems long term vision of "Digitizing Retail Inventory" is totally in line with the possibilities that the xArray gateway brings to the game," said João Vilaça, Founder and CEO of CreativeSystems. "The efficiency and level of item intelligence made possible by integrating xArray with our CreativeRetail platform makes it clear that this brings a new world of opportunities and value to the retailer." "We are excited to be partnering with Impinj in providing RFID real-time asset location solutions using the xArray gateway system," said Ashish Chona, Chairman and Co-founder at InSync Software. "The solutions we provide will enable us to solve some fundamental problems for our customers and unleash the power of item intelligence in the industries we serve, including aerospace & defense, high-tech, manufacturing and energy." "We are creating innovative solutions with the xArray gateway system that focus on using the technology to drive infrastructure improvements in healthcare," said Harold Clampitt, CEO at American RFID Solutions. "The platform makes it simple to collect accurate data with less effort, allowing caregivers to leverage big data and analytics to improve everything from the emergency department waiting times to better utilization of the surgical suite." To register for an upcoming webinar on the xArray gateway, please go to: http://www.impinj.com/xarray-webinar. Impinj is the leading provider of RAIN RFID solutions that deliver Item Intelligence to retail, pharmaceutical, healthcare, food and beverage, and many other industries. We work at the intersection of Big Data and the Internet of Things to identify, locate and authenticate billions of items, and our Item Intelligence platform comprises the most comprehensive and widely adopted RFID product portfolio in the world. For more information about Impinj, visit www.impinj.com. Impinj, xArray, Item Intelligence and Monza are registered trademarks or trademarks of Impinj, Inc. A listing of Impinj's trademarks can be found at www.impinj.com/trademarks. *Up to 1500 square feet when using Impinj Monza® R6 chips. Performance can vary with ceiling height, tag type and environmental/use case factors.